Imagine a 57 year old management professor donning the uniform of an undercover fast food worker for 14 months. Opting for this “hardship” research project during his sabbatical, he goes through seven jobs in burger chains like McDonald’s, Burger King, and Wendy’s. Along the way, the professor discovers “powerful truths about what makes businesses great” and provides lessons from behind the counter “guaranteed to supersize any management style”. Doesn’t that sound mouth-wateringly good? 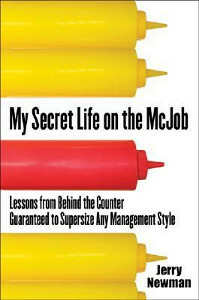 Allured by the delicious premise on the cover, I picked up a copy of “My Secret Life on the McJob: Lessons from Behind the Counter Guaranteed to Supersize Any Management Style” by SUNY Professor Jerry Newman (photo below). Written in an easy narrative, Newman’s behind-the-scenes expose paints a rather sordid picture of life behind the golden arches. In fact, his eatery experience was so trying that the good professor ended up with three herniated discs! Brought to life by a larger-than-life cast of managers, assistant managers, supervisors and other crew, the book chronicles what life is like at fast food restaurants. Through a wide range of characters – from super manager Kris, people-oriented James, to expletive-a-minute Freddy – one gains an insight into the culture, working processes and management style necessary to survive on the restaurant floor. Because of the wide range of roles, working in a fast food restaurant is often a test of one’s ability to multi-task and multi-skill. Fast food work is often stressful, fast-paced (especially during the lunch rush), and difficult to master. Newbies are thrust immediately into the line of fire, needing to serve irate and impatient customers despite lacking in skill or knowledge. The industry also suffers from high staff turnover. They range from 100% to as high as 500% per year (based on the author’s experience). This is attributed to the high burnout rate of staff as well as the fact that most employees are young school leavers who regard such jobs as stepping stones. 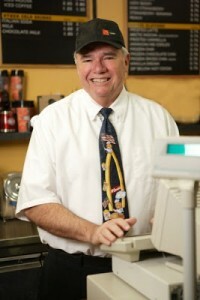 In Newman’s eyes, folks who work in the fast food business are often hard-pressed. Paying minimal wages for “dirty jobs” that are “dumbed down” as much as possible (via rigid processes), fast food restaurants recruit any warm body physically able to do the job. 1) Good managers are “ego architects” who spend their time building the self-worth of their employees. This improves commitment and productivity. 2) Good managers cultivate a sensei (kind of like an expert in specific tasks) who not only has superior task skills but is equipped with the requisite social skills and leadership ability to informally explain and maintain cultural expectations. 3) Successful restaurants hire folks who can fit into one’s culture, especially with their best incumbent employees. Rewards can often be provided through non monetary means like employee awards, birthday celebrations and other intangible motivational tools. 4) Training should be taken seriously and made appropriate to the tasks that one’s staff faces. Good managers instill the right behaviours the first time around. 5) To manage diverse teams, strong managers understand what makes each worker different and uses this knowledge to their advantage. 6) Strong managers build social webs and cultivate camaraderie in order to improve staff retention. This is particularly important in volatile industries. Admittedly, “My Secret Life on the McJob” is more entertainment than enlightenment. While I certainly enjoyed the book’s narrative style, its so-called “supersized” management lessons were less revolutionary than I’ve imagined. Having said that, I liked the way the book conveyed simple management lessons through parables which embodied what managers should (and should not) do to build a strong culture of motivated staff. It also opened my eyes to how little practices can make all the difference between success and failure.